Los Angeles Galaxy's David Beckham talks with reporters during a news conference. DAVID BECKHAM WILL announce the next stop in his career near the end of the year. Until then, he’s focusing on winning one more trophy with the Los Angeles Galaxy. Beckham said Tuesday he has several “exciting opportunities on the table” to continue playing after he leaves the Galaxy next month, capping a six-season U.S. career with Los Angeles’ second straight appearance in the MLS Cup on Dec. 1. 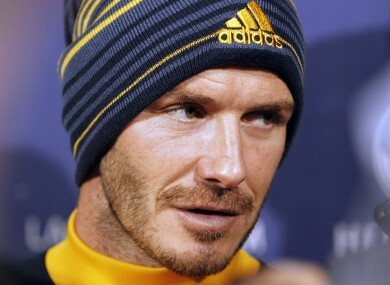 “I still feel that I have something left in me as a player,” Beckham said at the Galaxy’s training complex. “I still feel like I have one more challenge in me as a player. Even at 37 years old, I still can play at a high level. Where that will be yet, I haven’t decided. The English midfielder wasn’t specific about where he might end up next, deflecting questions about every destination from Australia and China to France and Britain. While discussing his future in the most oblique terms, Beckham only confirmed he won’t move to New York or any other MLS team. After two strong MLS seasons largely free from major injuries, Beckham says he’s leaving Los Angeles only because he reached every goal he set for himself in his landmark move stateside in 2007. He agreed to a two-year contract extension with the Galaxy last January after completing his initial five-year deal, but revealed the second year of his deal was a mutual option. Given Beckham’s acumen for managing his worldwide celebrity alongside his soccer career, his next destination could be Australia’s A League, where five clubs have confirmed interest in acquiring him to boost the sport’s relatively low popularity Down Under, or China’s Super League, where Didier Drogba and Nicolas Anelka already are playing for Shanghai Shenhua. Beckham politely declined to give any indication where he’ll play in the new year — but he confirmed he plans to become an MLS owner in the near future, sounding his usual optimistic notes about soccer’s future in North America. Beckham’s MLS contract includes an option to purchase a franchise when his career ends. He also did nothing to squash growing speculation he could become at least a part-owner of the Galaxy if he doesn’t get an MLS expansion team. AEG, the sports conglomerate that owns the Galaxy and the NHL’s Los Angeles Kings, is for sale. Beckham announced his decision to his teammates earlier Tuesday, although coach Bruce Arena and star Landon Donovan already knew about it. Beckham said he got a round of applause and “a little abuse” from the Galaxy, who will attempt to win their second straight league title against the Houston Dynamo at Home Depot Center next Saturday. Although Beckham is done playing for the Galaxy, it’s clear the global icon isn’t permanently leaving Hollywood. Beckham said his family considers it home, and he plans to “be at as many games as possible” next season. When asked if he would miss Beckham, Arena smiled. Email “Beckham mum on plans after leaving MLS, Galaxy ”. Feedback on “Beckham mum on plans after leaving MLS, Galaxy ”.